I’ve got a thing for orange and stripes (in pens only), so I tossed this pen into my Jetpens shopping cart, along with a handful of other pens and refills. (Gotta get that >$25 free shipping!) The pen I ordered came with a 0.3 mm refill, but the line was soooooo fine and so light that I just couldn’t get into it. So I recently ordered a 0.5 mm refill and now the pen feels usable. 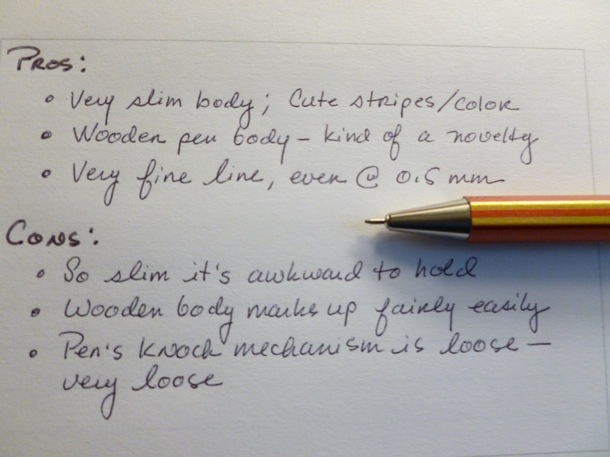 Aside from the pen color/stripes, I also like the fact that the pen body is made of wood. 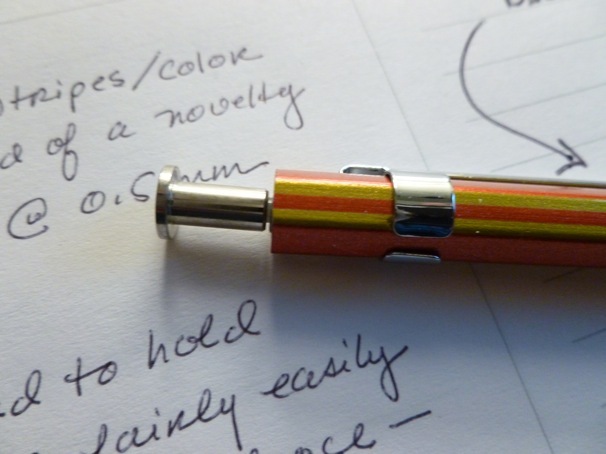 This makes the pen feel like a pencil in hand. Kind of cool. The line is very fine, even at 0.5 mm, and is pretty consistent and smooth, though not really as dark as I like. One thing I didn’t realize was how easily the wooden pen body could be marked up. This one’s relatively new, and well cared for, but already shows some dents and dings. (Ouch.) The other issue I’m having is with the plunger/knock mechanism. The one on my pen is very loose, in that it appears to be fully outside of the pen body. Because of this, it rattles when handled, though not so much when I’m actually writing. See what I mean about the knock? Strange. 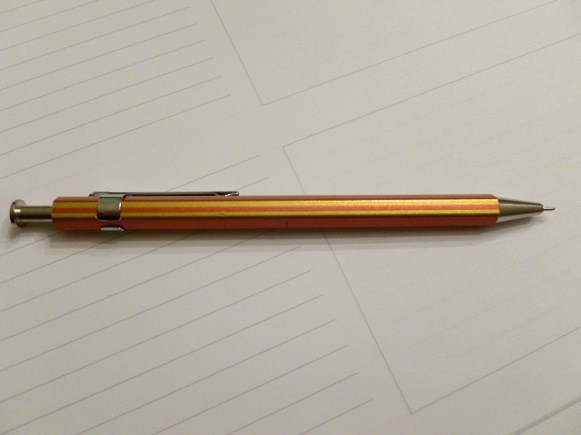 So, even though I’m happier with the 0.5 mm refill, this pen probably won’t make it to the prized pen cup on my desk. It’s more likely to be relegated to the one full of oddball pens in the kitchen. Too bad…the orange stripes are lovely.